There are certain friends everybody’s supposed to collect. A doctor, a lawyer, a pâtissier-confiseur…. We ran into each other at Trader Joe’s a few weeks ago, and she told me she’d followed in the family footsteps to become a pastry chef/confectioner/chocolatier. Her parents, Robert and Patricia, are the owners of Maison Robert, an Atlanta favorite since 1977. Maison Robert now sits on Peachtree Road in Chamblee near the antique shops. It’s in the front of a one-story office building. It took me a couple of tries to find it because it’s hard to see the front of the building from the parking lot. Glad I kept at it, though. Inside, I found Katia and asked her what to get (other the required baguette for supper). Katia’s advice was to stick to chocolates because I had a long, hot car ride home. There are two ways to interpret that. One, don’t buy a pastry. Two, buy a pastry and eat it immediately. I chose the latter route. There were many creamy, chocolate-y pastries to choose from, but the heat of the day called for the lemon tartlette. It was delicious! While pastries are all well and good, I get the feeling Maison Robert focuses on chocolates. 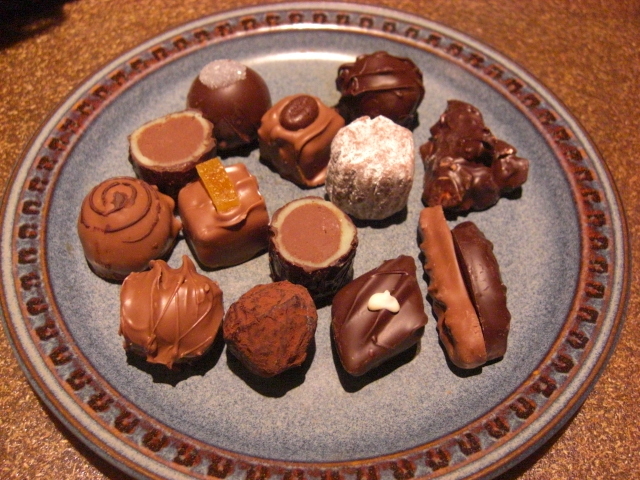 I bought a sampler box with 18 pretty little chocolates. Maison Robert is a wonderful find with lots of hand-made deliciousness: chocolates, pastries, bread, cakes, quiche, hot cocoa, and even classes on working with chocolate. They also serve a light lunch that I look forward to trying next time. Check out their website at www.maisonrobertchocolates.com for more info. Was Maison Robert formerly in Brookhaven? I remember a lovely patisserie there about 20 years ago. The chocolates look mahvelous. I write the food blog, Bunkycooks and live in Atlanta. I wanted you to know about the Food Blog Forum Event that is taking place September 10th and 11th in Atlanta. Please take a look at the link to the article on my blog as well as the event site link for specific details.